In an effort to foster more real-time communication between your app users & website visitors, a chat room is ideal. By getting our Chat Addon you can create a live community and a further reason for your audience to visit you again. You can view more information regarding Addons here. You can easily add Chat Addon to your plan by visiting your account and navigating to Get Addons. 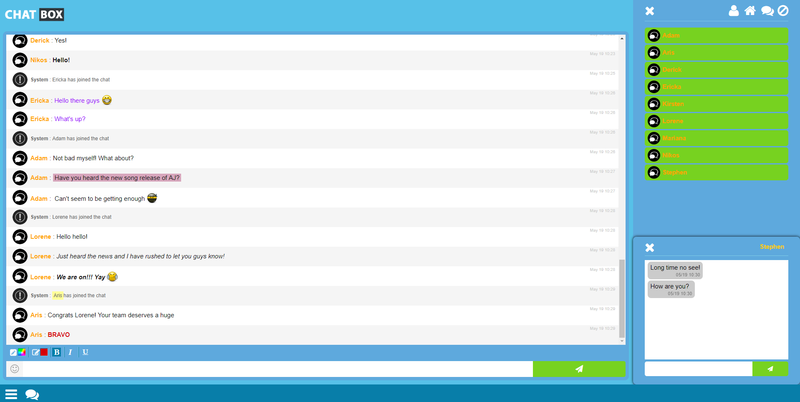 Our chat room comes with a great variation of smileys, admin tools (ban, unban etc. ), private messages, log history, user info, private chat commands, special message commands, name colour tags and flood protection. Moreover, users can log in with Facebook, Email or simply as guests. You can view the above pic in more details by opening it in a new tab.